Pipers Chair Holiday Homes Holiday Homes are located in the heart of Doolin close to pubs and restaurants. 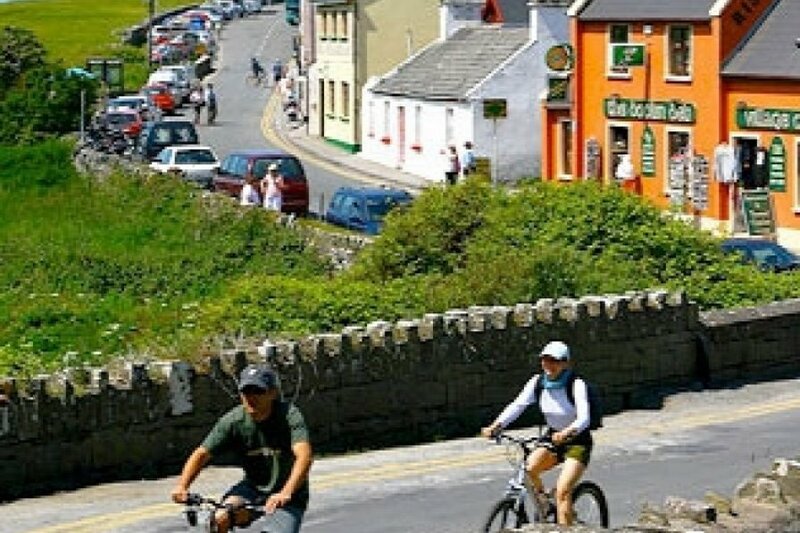 Doolin is a fun and vibrant village perfectly located to enjoy all that Clare has to offer. Rivervale Holiday Homes are located within five minutes walk of Doolin Village. The village itself is traditionally a fishing village but is now better known for its traditional music. This is a prime rural seaside location offering an array of activities and breathtaking scenery, which makes an ideal choice for your holiday break. Doolin is located 8km from the Cliffs of Moher, 6km from the famous spa town of Lisdoonvarna and just a fifteen-minute drive from the town of Lahinch. Rivervale Holiday Homes are a lovely new development of eight holiday homes. These bright and airy houses can accommodate up to 5 people - in one double bedroom, one twin bedroom and one single bedroom with a separate bathroom. The houses have been fitted out and equipped with high quality furniture and fittings catering to your every need. The open plan kitchen/dining area contains all modern conveniences including electric cooker, microwave, washer/dryer, dishwasher, kettle and toaster. The lounge area has been tastefully decorated and is furnished beautifully with a cosy suite of furniture; colour television and a welcoming open fire. The mouth of the River Shannon is home to Ireland's only resident community of bottlenose dolphins who thrive in this safe habitat. The estuary provides the dolphins with a rich source of food and a safe habitat for mothers and calves and is one of only six such breeding communities in Europe. The local dolphin watch tours boast a sighting rate of 98% during the months of May to August and operate from the towns of Kilrush and Carrigaholt. Doolin has its own excellent nine hole pitch 'n' putt course and Lahinch has two golf courses - the Castle Course and the Old Course are located just a 20 minute drive away. Within a ten-minute drive of Doolin there are two beautiful beaches - Fanore Blue Flag Beach with its fantastic sand dunes and shore fishing and Lahinch Beach that is popular worldwide with surfers. Seaworld offers a truly unique experience, which can be enjoyed by all the family - it provides a wonderful insight into the underwater life of the Atlantic Ocean and the Leisure Centre has a 25-metre pool, kiddie's pool, jacuzzi and sauna. Located 20-minute drive from Doolin, Aillwee Cave is one of the west of Ireland's top tourist attractions with its stalactites, stalagmites, relics of bears and waterfall. Open daily from mid March - October.